Although he lived a long time and ruled nearly fifty years, Basil II never had any sons. When he died in 1025, his brother Constantine VIII succeeded. He, too, had no sons, so he left the throne to his fifty-year-old daughter Zoe and her husband Romanus III. Romanus lost several battles against the Abbasids and quickly died, apparently because Zoe poisoned him. Zoe’s servant (and boyfriend) Michael IV became co-emperor with the Empress Zoe, and then in 1041, when Michael died, Zoe co-ruled with Michael’s nephew, Michael V. In 1042 Michael V tried to get rid of Zoe, but this led to revolts, and he was taken off the throne, blinded, and sent to a monastery. Zoe took over power again with her sister Theodora. But soon she remarried to Constantine IX, who outlived her. Zoe died in 1050, and Constantine in 1055. 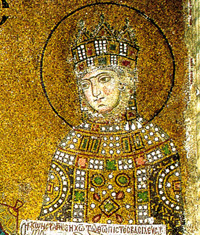 Theodora, Zoe’s sister, became Empress, even though she was seventy years old. When Theodora died in 1056 AD, with no children or living relative, that was the end of the Armenian dynasty. There were a series of civil wars while the Romans tried to decide who was going to take over. While this was going on, the Romans naturally couldn’t pay very much attention to protecting their borders, because they were busy fighting each other. Because the Romans were not paying attention, and there were no good rulers, the Seljuks succeeded in taking control of Armenia away from the Roman Empire. When the Roman emperor Diogenes tried to get Armenia back at the great battle of Manzikert in 1071 (using Viking mercenaries as his soldiers), he not only lost but was captured by the Seljuks. The Romans had to give up their claims to Armenia and let Alp Arslan, the ruler of the Seljuks, have it in order to get Diogenes back. They also had to fight a rebellion of the Norman mercenaries, who wanted to be paid even though they had lost the battle. In the end, Alexis Comneni, from one of the families involved in the civil wars and the successful general who had ended the Norman mercenary revolt, took over the rule of the Roman Empire in 1081 AD. Cite this page: Carr, K.E. 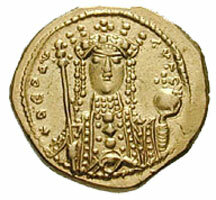 Zoe and Theodora – Byzantine History. Quatr.us Study Guides, August 2, 2017. Web. April 23, 2019.